The Old West heritage and charm of the Temecula Valley is beautifully on display in vibrant Old Town, a favorite spot for locals and visitors seeking to shop at the region’s most unique and exclusive boutiques and stores. 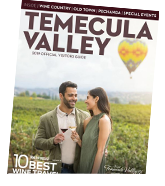 Visitors to the region can meander the wooden paths of yesteryear while bargaining with antique dealers, selecting their next piece from art galleries, or sampling locally-made, artisan goods at independent, Temecula boutiques. The weekly Farmer’s Market displays not only the bounty of the region’s harvest, but also a diverse display of artisan workmanship and exclusive goods for sale. Get ready to shop local in Temecula.